Clean the crab and boiled it for 2 minutes. Take only the fleshy parts for cooking. Heat a pan add bay leaf, jeera and whole garam masala in it. Add onion paste, garlic ginger paste, tomato puree in it. Now add curd and salt, turmeric powder ,garam masala powder and the crab in it. Mix all and fry them till it removes oil. Add water in it. Cover it for 10 minutes in a slow flame. Garnish it with coriander leaves and serve hot with Rice or Paratha. 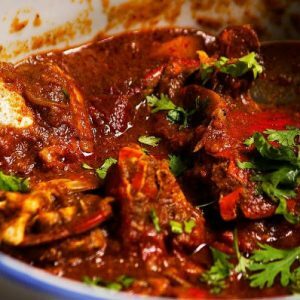 Feel free to comment or share your thoughts on this Masala Crab Curry Recipe from Awesome Cuisine.